If Paulo Coelho’s best-selling, uber-iconic, The Alchemist, had a soundtrack, “The Gypsy Diaries” would be it! 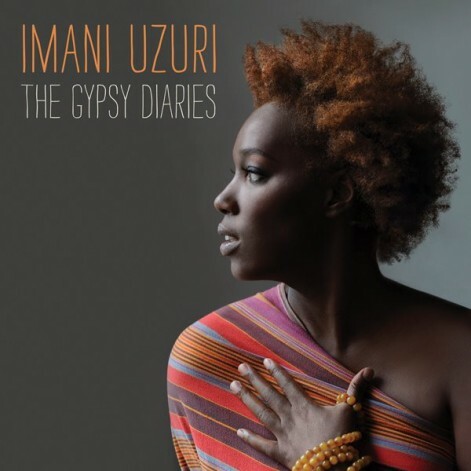 On “The Gypsy Diaries,” Imani Uzuri’s sophomore solo CD, it feels as though Imani just ripped pages from her personal journal and set them on fire through testimony and song. Her music, including her first album “Her Holy Water,” is largely about self-discovery and how losing yourself via travel– especially for a sister that appreciates sand between her toes and collecting stamps on her passport—can actually help you find your way. It’s funny because I can’t remember what I did last Wednesday night, but I clearly remember my first time ever seeing Imani Uzuri. It was maybe ’97 or ’98 and I had just started working at Epic Records in their A&R Department. My boss, Michael, was always looking for new artists and I loved doing the unglamorous work of going out and scouting talent. Imani and I had met through mutual comrade Greg Tate and she had invited me to a couple of her shows, but I was never able to make any of them. This particular night she was playing at CB’s Gallery, right next door to CBGB’s. It was 9pm and I had been in the office going on 11 hours and all I wanted to do was take my tired behind home. But something that night, despite my exhaustion, was calling me to the East Village. When I walked into CB’s, Imani was already on stage and mid-song. “I need some calming water; I need some calming water,” she was singing, almost chanting. It was different. Mesmerizing. I didn’t even get in the door real good when the tears began to roll down my cheeks. It was a release I didn’t even realize I needed. Immediately, without fully understanding the breadth of Imani’s musicianship, I knew the spirit from which she sung. Her singing while grounded in the Blues and Spirituals, is also propelled by this exuberance for all that life has to offer—the good and the bad; the highs and the lows; the pretty and the gritty. 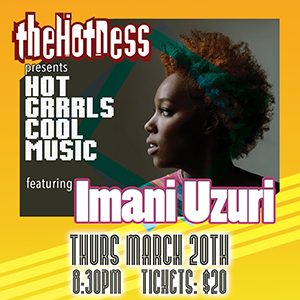 If you haven’t seen Imani bless the stage with her powerful presence and, I have to add, highly comedic stand-up skills, please join me for the re- launch of my Hot Grrrls Cool Music series and check her out this Thursday evening, March 20th at Red Rooster in Harlem. And Thursday is not only the re- launch of Hot Grrrls Cool Music, but it also marks the first day of Spring and what better way to celebrate Mother Nature’s thawing than with a woman who sings about self-revelation, whose band includes a sitar player, and who can dutty wine with the best of them! Heard her sing when I visited Brazil. Enjoyed it. Hope I can get to see and hear her soon.